Our Custom Table Covers and Throws will make the best first impression for your brand during tradeshows, job fairs, and other business events. Available in a range of models, material choices and sizes, they can be imprinted with your brand, message, and artwork to ensure a 360 degree display. 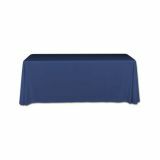 Table covers and throws not just enhance the appearance of the venue but will also grab easy attention of the attendees. Made of fire retardant wrinkle free material, our table covers retain their brilliance and color clarity for a very long time. Shop from our collection of Table Covers and Throws and take advantage of the best prices, quick shipping, and much more! 100% customer satisfaction guaranteed! 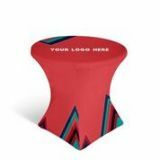 Our personalized Table Covers and Throws will give your booth the professional look it deserves and make a perfect addition to your next Trade Show or Event. Table covers are the best way to show classiness and makes your booth stand out from the rest. A smartly customized table cover will make the audience sit back and take a note of your brand. Available in various models that ensure a perfect fitting, custom table covers can ensure a quick make over to even a nondescript venue at easy prices. Tradeshow Table Covers and Throws are designed to last long and can be reused again and again. This ensures maximum value for money. Tuff Flags has an impressive line up of custom table cloths and throws including fitted top round table cover, secure fit stretch table covers, 4 sided table throw, 3 sided poly poplin table cover, quick change message table runner and a lot more to cater to your specific requirements. 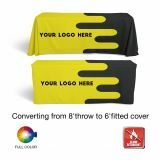 Custom Table Covers and Throws are available in a range of styles and color choices that will let you choose a model that matches your corporate color or promotional theme. 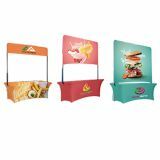 Our high quality tradeshow table covers offered in eye pleasing designs will make a smart way to dress up shabby tables and to conceal the promotional items underneath neatly. Table covers make a cost effective way to enhance the appearance of tradeshow booths and will help meet your display needs. Browse our collection and choose custom table covers and throws that will impart a professional look to your booths and get the much desired attention from the crowd. Should you need any selection tips or custom design assistance call us at our toll free number (888) 287-3524 or email us at customercare@tuffflags.com.